To begin, let’s establish what exactly we’re talking about when we say “biodiesel.” ASTM (American Society for Testing and Materials) has published a standard, D6751-07b, that defines what biodiesel is. We’re not talking about used cooking grease, or even commercially produced biodiesel, if it doesn’t meet this standard. Also, the word “biodiesel” is often used to describe what is actually a blend of biodiesel and diesel fuel. (The diesel fuel sold for on-road use in the U.S. is Ultra Low Sulfur Diesel fuel, or ULSD.) The term “BX” designates the blend ratio, where “X” stands for the percentage of biodiesel in the blend. So B100 means 100%, or pure, biodiesel, while B20 means 20% biodiesel mixed with 80% ULSD. Additionally, this article doesn’t address OEM recommendations or warranty limitations. We’re simply looking at the question from a mechanical standpoint. So now, with all that out of the way, what’s the bottom line? This applies to engines that have burned petroleum diesel for years before switching to biodiesel. Over time, petroleum diesel leaves small carbon and tar deposits in a fuel system. B100, a mild solvent, will “clean out” the fuel system, dislodging these deposits. This is a good thing, but it’s inconvenient when a fuel filter clogs with these deposits. Once the fuel system is clean (usually after burning 1-2 tanks of B100), this issue goes away. B20 and lesser blends do not have this cleaning effect. Biodiesel begins to gel at a higher temperature than ULSD. As a general rule of thumb, the greater the percentage of biodiesel present in a blend, the higher the temperature at which it will start to form wax crystals too large to pass through the fuel filter. In extreme cold, without a fuel preheating system, all but the most dilute biodiesel blends may be impractical. Now, let’s discuss changes in diesel engine technology. These engines work very well with B100 (as well as with lesser blends). In fact, biodiesel is often a superior fuel for these engines. It is a far better lubricant than ULSD, sharply reducing injection pump wear. Unlike ULSD, which is made up solely of hydrocarbon chains, biodiesel molecules also contain oxygen. This oxygen contributes to better combustion. Thus, even though biodiesel has a lower energy content than ULSD, some engines may actually see a slight increase in power output, with minimal loss of fuel economy when using biodiesel. Any biodiesel blend works great. Diesel engines with common rail injection systems started showing up in the early 2000s. These systems burn ULSD more efficiently than older systems, so biodiesel’s oxygen content no longer offers any real efficiency advantage, and its lower energy content manifests itself in a slight reduction in fuel economy and power. Further, high precision common rail injection systems are “tuned” to fuel of a given viscosity, and the viscosity of B100 differs significantly from that of ULSD. This may, for example, change the spray pattern of fuel into the combustion chamber, and the end result can be an increase in soot and carbon buildup. While B100 works, these engines work best with lower blends, like B20. In 2008, the EPA started phasing in its Tier IV diesel emissions standard, which required an immediate 90% reduction in particulate matter. Diesel particulate filters, or DPFs, are exactly what they sound like – a filter in the exhaust system that captures particulate matter, such as soot. To regenerate, or clean, the filter, atomized ULSD is injected into the exhaust. When it reaches the DPF, it ignites and burns off the particulates that have collected there. To accomplish this, many engines periodically inject ULSD into the cylinder during the exhaust stroke. This ULSD vaporizes and flows through the exhaust system with the other exhaust gases. Biodiesel, however, is less volatile than ULSD. When it is injected into the cylinder during the exhaust stroke, rather than flowing out through the exhaust valve as a vapor, some of it condenses on the cylinder walls as a liquid and runs down through the crankcase. Over time, this biodiesel accumulates and dilutes the engine oil. Thus, for engines equipped with this style of DPF regeneration, biodiesel blends generally should not exceed B20. Some DPF systems are able to eliminate this problem by using an extra injector located in the exhaust system to handle regeneration. Such configurations don’t cause engine oil dilution and so are compatible with B100, but they are also less common. B20 works with DPF-equipped diesel engines. Higher blends work with some engines with specific configurations for DPF regeneration. Complications associated with using B100 may vary from negligible to major, depending on the engine configuration and the operating environment. B20 and lower blends, on the other hand, present minimal complications when used in any modern diesel engine and in all but the coldest operating environments. 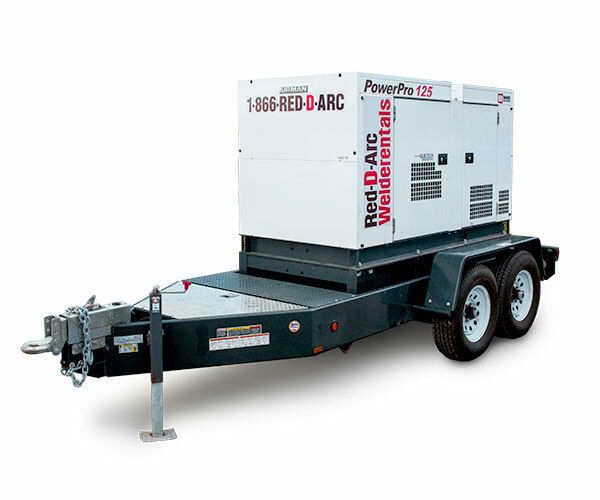 Red-D-Arc carries diesel, LPG and natural gas generators in a range of sizes. 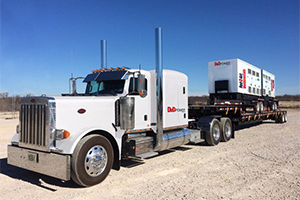 D&D Power provides full service oilfield generator rentals including generator paralleling. 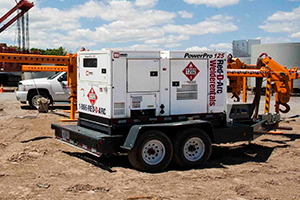 We also provide diesel air compressors for rent. Since 1996, the EPA’s regulations for non-road diesel engines emissions have been phased in through four progressively more stringent tiers. Different tiers went into effect at different dates for different engines, but since 2015, all new non-road diesel engines, including stationary engines, but comply with the EPA’s Tier IV (Final) standard. Today’s Tier IV compliant diesel engines are far more complex, efficient, and expensive than their unregulated ancestors from the early 1990’s. How does Tier 4 compare with the previous generation (Tier III)? For Tier III, the standard focused on reducing NOx (nitrous oxides) and NMHC (all hydrocarbons except methane) emissions to levels on par with federal requirements for on-road diesel engines. Since these non-road emissions were unregulated prior to the Tier Emissions Standards, we have no basis for a hard comparison, but the EPA estimates that since 2010, Tier III has been reducing NOx emissions by about 1 million tons per year. This is the amount of NOx produced annually by about 35 million cars. Conspicuously absent from Tier III was any limit on PM (particulate matter), although the Tier II limit still applied to Tier III motors.